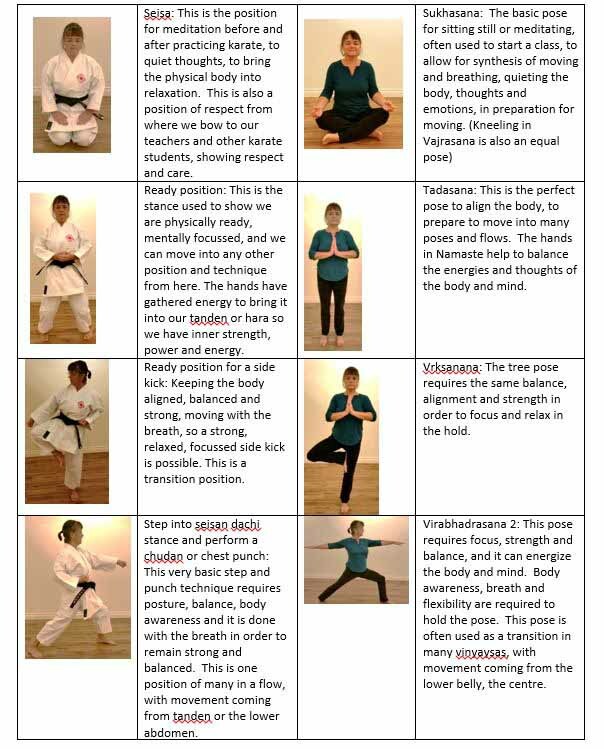 A student recently asked some questions regarding the integrating yoga with martial arts. To answer these questions in the best way possible, we asked our SOYA Teacher Trainer in Pitt Meadows, who does just that! She has been practicing yoga for more than 40 years, and karate for 23 years. Here is how Dorothy Fizzell has responded to these questions. Is anyone practicing both yoga and martial arts willing share their experiences on what is similar or different? I started yoga in about 1974 when I was at university and wanted a “cheap” form of exercise that I could do on my own. I started karate in 1995, after watching my then 9 year old son in his karate class. I had been looking for a form of aerobic exercise that had some “meaning”, rather than doing just aerobics or some other form of exercise. Little did I know how both practises, yoga and karate, would play a huge role in developing who I am! When I started karate, I kept yoga and karate completely separate as I thought they were two very different things. I actually started karate training the same month that I began my SOYA 500 hour teacher training with Mugs. This same month my mother passed away at a relatively young age. These seemingly different experiences are so interrelated and have changed my life. For me, I do not believe that I could have kept up the karate training at the beginning if I had not been practicing yoga. Physically, both are similar in that you work at strengthening, flexibility, efficient movement, coordinating the breath with movement, body awareness etc. Karate is much more intense, fast and involves being able to disable or take down opponents who are attacking you. But the intensity of holding poses, breath control, focus, body alignment in yoga helped immensely. The style of karate I practice, Chito Ryu, also has a huge component of learning about the Self, by directing energy, meditating, and being able to defend yourself while at the same time remaining peaceful. We have a Japanese word, reigisaho, which translated means “manners and etiquette”, but it also involves being aware of those around you, taking care of other’s needs (even before they know they have a need! ), being humble, being kind, respectful and caring for the community. We mediate twice – once before and once after every class – in order to bring together our learning, to connect with the energy of ourselves and the Universe, to prepare and to be at peace. Has yoga influenced eastern martial arts? Historically yoga has connections with Hinduism for sure, and yes, martial arts can be used for very violent purposes. However, my understanding is that Indian martial arts as well as the concepts of Hinduism and yoga have influenced all other martial arts systems. There are monks who practice martial arts. Apparently one section of the Yajur Veda has references to martial arts, known as Dhanuraveda. Some classical Indian hand mudras have been incorporated into martial. To me, the yamas and niyamas of yoga are equivalent to many aspects of reigisaho – that is, no violence, no stealing, having focus, having discipline, being open, not being greedy, constantly learning, and being selfless. To me, practicing yoga and martial arts is about improving my physical, mental and spiritual health. I have been very fortunate with my karate teachers or Senseis, and they remind me at times to “Bring your yoga into this Dorothy.” They have allowed me to teach yoga to karate students. Once in Penticton, my Sensei asked me to lead savasana at the end of the training. We trained in a noisy community centre gym under fluorescent lights, with people coming and going, and everyone’s adrenalin surging after an intense class. As I guided them through the savasana, almost everyone in the class (35-40 students from 12 years up to older adults) became still, relaxed and open. Everyone’s energy synchronized and became at peace, and the group stayed for a good 10 minutes. It was quite remarkable! I had a couple of students who had no experience in yoga at all tell me it was an amazing experience.How are yoga students practicing martial arts viewed? How do yoga gurus feel or respond to their philosophy being incorporated into martial arts? A few years ago we visited Kumamoto to practice with the head of our karate style and we visited the sacred location of Musashi. A very famous Samurai who lived to an old age – meaning he was an expert and violent fighter – lived at this location. He sat and meditated for years, and wrote a famous book called the “Book of Five Rings”. In this book are techniques for being an excellent Samarai, and many of it is about meditation, being peaceful, caring for your community and making it beautiful (eg calligraphy). There are also two huge Samarai statues at this location; one with his mouth closed, and one with it open. One of the senior Senseis explained to me that one was saying “AH” and the other was saying “MM”; in other words, AUM! I believe we are all spiritual beings, who in different places have developed different ways to become more in touch with our spiritual side in this physical world, and over time, many of these ways have touched, mixed and become something new. I am not sure we can draw a clear line between the lineages of yoga and those of martial arts – it is more like a tapestry of styles and ideas that come together in beautiful patterns and colours. We shall reach our goals. So, at times, yes, I hit a glitch that feels like a contradiction, but both yoga and karate are ways to become connected with your inner Self and with the Universal energy, God if you prefer. There are those who say that yoga and/or karate is going against Christian beliefs, but again as one brought up in the United Church, I find it is parallel and there is no conflict. I do not believe anything I have done in either practice contradicts the Christian values I have and in fact they have clarified and emphasized them for me. I don’t believe yoga and martial arts contradict each other and in fact they complement and enhance each other. I think each practice can assist with the other one – they are both about connection with the body, mind and spirit. There are those who will say that yoga is about peace and karate is about violence, but my experience has not been that. These are some random thoughts giving you my perspective of my practice. I am passionate about both yoga and karate, and have integrated aspects of both into everything I do. If you have other questions or comments please message me back. Hope this helps with your inquiries! Dorothy Fizzell, E-RYT500, IYTA, SOYA, is leading the SOYA 200 hour training with Jools Andres in Pitt Meadows this Aug-Dec, 2018. For more information on this training or to contact her, go to www.soyayoga.com .